An MRI is often used to evaluate the possibility of injuries to ligaments and tendons. Problems in the spine, such as a disc herniation are seen well on an MRI image. Masses and tumors within soft tissues can also be evaluated with MRI. 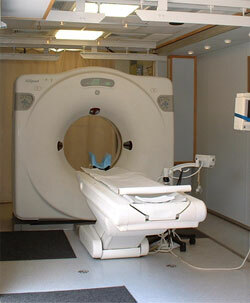 Our services provide a mobile MRI, with comfort. The results of the MRI will be sent to patients and their doctors and primary care givers within ten business days. 48ft. of space on the mobile site, this is spacious and provides comfort to the patients. State-of-the-art unit for MRI testing. JCAC (joint commission accreditation committee). A lift for the patients. Accessible and available for any site. The mobile unit has its own computer station, scanner and printer. Provided follow-up phone calls for patients if additional testing is needed.